Tranquil Body Treats / Gee Whiskers! One of the great things that I truly love about my blog is that since starting it I have discovered so many brands that I didn't know about because I do a lot more research online and I have learnt so many new things. Tranquil Body Treats is one such brand that I discovered and after about 2 months of admiring the brand I ordered a few products the other day to test out. I ordered 2 bath sherberts in Chocolate and Vanilla and Romance Rose and Ylang Ylang because I had never seen a body product like that before as well as eczema cream for my Mom (a review will be up on her blog, Rose Petal Wishes in the coming weeks). During the process of me placing my order there were some problems experienced with the online ordering system. Leigh-Ann from Tranquil Treats actually picked up from a tweet of mine that I had placed an order and followed up with me and we discovered the problem with the system. After a few emails we had my order sorted out and one thing that seriously surprised and impressed me was that Leigh-Ann asked me to choose ANY product I wanted from the product offerings as an apology for the inconvenience I experienced, which in all honesty was not a bad experience at all because Leigh-Ann is so pleasant to deal with. After a few extra emails going back and forth (I felt bad choosing something when I had made a relatively small order. ), we agreed that I would choose a fragrance and I would be treated to a surprise. I was so happy to see that inside my parcel was the much talked about Body Salt Scrub in Tranquility Bluebell and Thistle. Tranquility Bluebell and Thistle Body Salt Scrub - I have mentioned in previous posts that I love using body exfoliators because I like having smooth skin and how it makes my skin glow. A lot of people don't realise that if you don't exfoliate your skin regularly the products you use can't penetrate through the dead skin and just sits onto of the dead skin cells. In essence it's a waste to use anything if you don't prepare your skin properly beforehand. There has been great hype around this product by all the Tranquil Body Treats customers I have tweeted and chatted to. The first thing i noticed about the product was the amazing smell and then the colour of it. Personally I love the colour because it makes the scrub fun to use. The absolute best thing about this scrub is its gentle ability to smooth skin. Because refined salt is used, it is similar to how fine sand paper smooths wood. It makes my skin feel absolutely silky smooth and soft and I love using it. The scrub has an assortment of natural oils to nourish and moisturise skin so it's not entirely necessary to moisturise afterwards if you don't battle with dry skin. 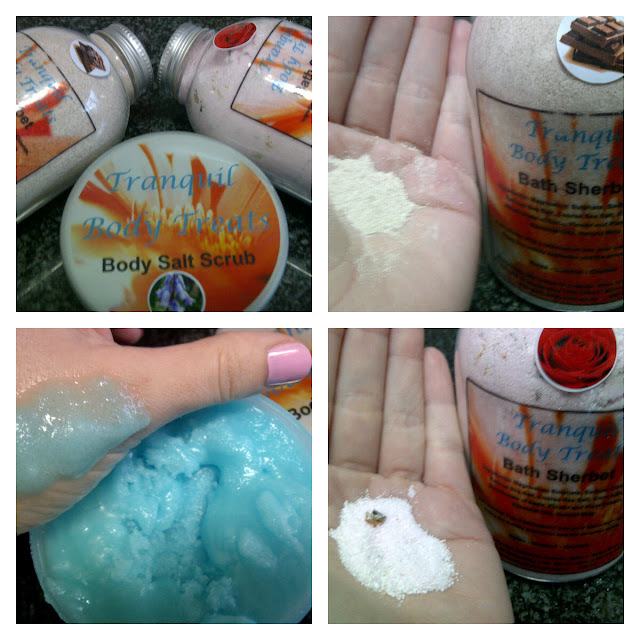 At R66 for 125ml it is the cheapest body scrub I have used to date and an added benefit is that you get a spa quality scrub for such a reasonable price. Bath Sherbert - This product is so much fun to use! Just like bath bombs fizz when submerged in water, this sherbert fizzes and the scent bubbles to the surface as the product hits the water. The water becomes beautifully softened and enriched with nutrients, it's perfect for soaking in. I ordered 2 bottles because they are only R45 per bottle and each bottle is filled right up to the brim. I have the Chocolate and Vanilla and Rose and Ylang Ylang scented sherberts and it's rather difficult to say which one is my favourite, both are equally indulgent to use - I've even mixed the two together. I am incredibly impressed with not only the products but also the fantastic service I received. I can't wait to try out more of the products on offer. With so many choices of fragrances and products it's going to be tough to choose my next order. 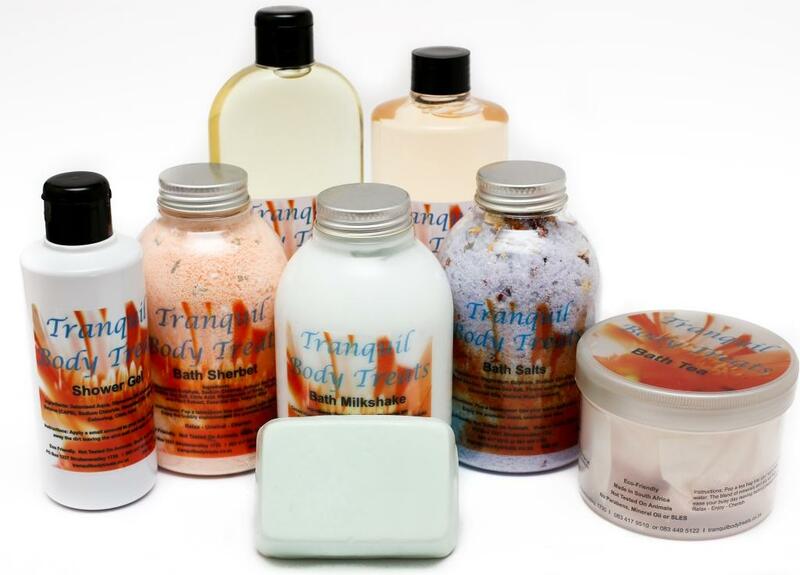 To view the full product range and order products visit the Tranquil Body Treats website. Follow Tranquil Body treats on Twitter and Facebook. I love body scrubs! Would like to try it. If I saw these products in a shop before reading your review I would probaly not purchase it because the packaging is not very attractive. Does it smell great? I have heard that people are not impressed with the packaging - but once you open up the products you don't care what the packaging looks like. This body scrub in particular is AMAZING! I have tried the 3 different fragrances and they are all so beautiful but what's so incredible is that there is a nice balance of fragrance - it's not seriously overwhelming like store bought products. The scent is there but doesn't knock you over when you smell it - something I personally love. I love the word "Sherbet". It reminds me of being a kid again :) Great post! Great post Charlene! I'm glad you enjoyed their products as much as I have. That bluebell scrub looks incredible - love the colour as well. It's like having a smurf bath. Haha. Their sbrubs really are fantastic. Thanks Chicara - the products are INCREDIBLE! I can't wait for my soy massage candles to arrive! I ordered 3 in the same scents as the products above - because I loved them all so much. To be honest, I am having a tough time deciding if I like Tranquil Body Treats or Body Thrills more - but Tranquil Body Treats is leading with the body scrubs and amazing customer service. Thank you for the lovely review. Good thing we're busy changing our branding ;) It was an absolute pleasure doing business with you. Lemon Grass is a great favourite at our Rosebank Rooftop shop and smells gorgeous! Glad like the review so much :) I adore the products!